Showing results for tags 'super powers'. Hello fellow gamers! Unified Powers is Akerbakk's first contribution to BRP Central. This is a document that brings all powers from the BGB together in one place, eliminates redundancies, and assigns separate rulesets called 'Power Origins' to differentiate how characters use them. The ruleset is based on BRP from the BGB with some houserules. Most significant is that I added a characteristic, Awareness (AWA), and all Characteristic rolls are replaced with Attributes - this is to promote opposed roll mechanics wherever possible: Attributes are percentile scores determined by a combination of two characteristics each. They collectively quantify your character’s mental, emotional, and physical resilience. 1. Willpower =2(INT+POW)+10: Determines if the character’s mental focus will hold up. Use to resist mental probes and attacks and to avoid distractions. 2. Composure =2(AWA+AFF)+10: Determines if the character will startle or balk under pressure or fear. Used when calm or levelheadedness is needed. 3. Physique =2(STR+CON)+10: Measures the character’s overall health and fortitude. Used to resist injury, poisons, and diseases or for prolonged physical exertion or hardship. Unified Powers is a draft, and comments/ideas are welcome! Hello fellow gamers! I have uploaded my first contribution to BRP Central. It is a document entitled Unified Powers, and can be found here http://basicroleplaying.org/files/file/516-brp-unified-powers/ Unified Powers was born out of a desire to have all powers in one place. I've played GURPS. I've played Savage Worlds. I like the way they do powers, but I prefer BRP/ D100 as a system. I want my players (and myself as a GM) to have as many options available for powering characters, and I feel that the different power categories with separate spells/powers/etc is too confining for my tastes. 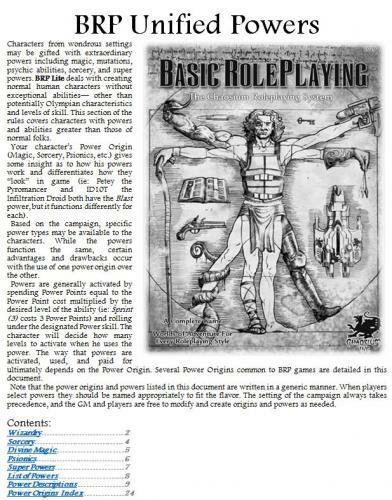 In Unified Powers, powered characters choose a 'Power Origin', a ruleset that governs how their powers work systemically and narratively in the game. Then they choose their powers from a generic list, flavor it all to fit the game, and voila! Your [wizard, sorcerer, priest, psi, super] is ready to go. Here is how I have set up my Power Origins, in quick bullet point format: WIZARDRY (Rote casting of magical formulae to create mystical effects.) -Moderate amount of starting Spells (INT/2) -Fast power progression: Buy a new spell with Experience (EXP) = PP Cost for one level. -Very skill dependent; Powers are split across 5 different skills (Spell Colleges) with an occupation required. -Access to a versatile craft skill that greatly expands the wizard's power and abilities (enables wizard to make staves, familiars, and scrolls). -Can increase skill percentile by increasing casting time. -Can cast spells silently with extra PP cost and successful simultaneous Stealth roll. SORCERY (Fantastic manipulation of reality through improvisatory enchantments.) -Lesser amount of starting spells (INT levels of spells) -Moderate power progression: Buy a new level with EXP = PP Cost -One skill (Sorcery), with disastrous fumble results. Armor penalizes skill. -Metamagic can alter the statistics (targets, range, damage, duration) or link spells. -Sorcerers can weave Power points into spell. Safely done with time, extremely risky if rushed. DIVINE MAGIC (Channeling the power of a deity into the world.) -Vast amount of starting powers, but limited PP to use (Deity Alignment = PP Cost limit) -Slow power progression: Increase Alignment or gain further blessings. -Less skill dependent: Faithcasting casts the powers, Knowledge (Religion) has supportive roles. -Blessing: a free power gifted by the deity that fits the individual cleric's calling. -Requires attention to the tenets of his faith for cleric to retain his powers. PSIONICS (Unlocking hidden powers of the mind.) -Small amount of starting powers (POW/5) -Expensive power progression: EXP cost = 5x Power Point cost of new power. -Skill dependent: Powers split across 3 Psionic categories. -Higher skill means greater Power Point efficiency. Can further extend Power Points by Rending (1 HP = 1 PP) -No limit to power level except Power Points available. SUPER POWERS (Extraordinary abilities from a myriad of sources.) -Moderate starting powers: Point-based budget from highest Characteristic to buy powers per level at outset. Power modifiers can increase budget. -Laterally increasing cost to upgrade powers. New powers typically unavailable. -Generally not skill nor Power Point dependent. -Power Stunts enable super to use powers in creative ways and temporarily mirror effects of other powers. Requires Power Points. Unified Powers is a draft, and comments/ideas are welcome. I posted this on the BRP subreddit (http://www.reddit.com/r/BRP) a while back, but I wanted to ask here and see what everyone thought. Anyone had any experience running or GMing very high powered/cosmic level superheroes in BRP, either with Superworld (which I think is terrific and underrated) or with the super powers in the Big Gold Book? I know that common wisdom asserts that superheroic BRP games work best from street-level characters up to about Spider-Man power levels, but then breaks down from there (indeed, the example characters in Superworld fall into this power range, and the DC and Marvel characters that were statted out to promote Superworld using during its initial publication were the New Teen Titans and the X-men, all of whom--at least at the time--fit right in that mid-range power level as well). From reading the superhero material created for BRP, I feel like there is nothing intrinsic in the game (especially in Superworld and its companion books) to prevent the creation and effective play of really powerful characters, and that the system could handle cosmically high power levels as well as any superhero system. It's just a matter of handing out the points so PCs can make a Superman or a Silver Surfer or another ultra powerful character, and then making sure that other characters, especially NPCs, aren't overwhelmed by the potential lethality of the power levels (which would be a problem that seems both logical and easily avoidable with basic houserules or general GM fiat). I realize that high-end characters present their own problems in any system; I just don't see anything unique or inherent in BRP/Superworld that would prevent these characters from being workable and fun. However, I haven't been able to test this out for myself yet and I could easily be missing something. Any thoughts or opinions on this?